Check out these popular styles. The LS2 OF569 is the go-to helmet for when it’s hot outside. You will appreciate being able to lift the shield and get some air when you are stopped at a light or filling the tank. The face shield is optically correct and flips up and out of the way when needed, and uses the ShortShift Tool-less Quick Release for easy replacement. The HJC IS-33 2 is a configurable helmet featuring modern styling and an internal sun visor. 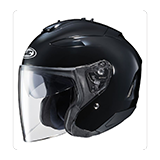 For cooler temperatures or extended highway travel leave the full face shield intact. For warmer weather or slower speed riding you can swap out the shield for an integrated peak visor to increase airflow. 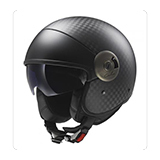 Sets a new standard for ultra-lightweight style and performance in an open face motorcycle helmet. Built from our wide-weave pure carbon fiber, this is a product built for riders who appreciate both function and style. Lightweight. Great for riders who have issues with their neck. Technically advanced. The Cabrio includes our Twin Shield System drop down sun shield and a DOT approved quick release chinstrap for a secure fit that is easy to get on and off. 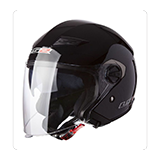 The Scorpion EXO-CT 220 three-quarter helmet comes with an internal retractable speedView sun visor, a detachable, extended-length EverClear No Fog Faceshield and a removable visor. Also featured are KwikFit cheekpads and KwickWickII liner fabric, a quick-change ratchet system to remove and install the visor, and plenty of ventilation. Sizing options range from XS up to 3XL. 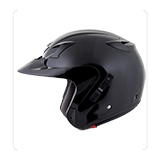 Can be used as a full face ADV helmet with external peak visor attached, or the peak visor can be removed and you have an aerodynamic touring helmet. Protection. Snug, comfortable fit. Styling. Cost. All of these factors come into play when selecting a helmet. Come in and let our trained staff help you choose the right helmet. Ask us about our convenient layaway plan. Road Rider of Reno © Copyright 2015.